The MicroMolar Primary Amine Assay Kit is designed for measurement of primary amines or ammonia or their salts at micromolar concentrations. Amino acids, peptides and many drug molecules contain primary amine groups can be quantified using this kit. Protonated primary amines or ammonium salts release the free primary amine or ammonia in the kit assay buffer. Primary amines or ammonia interact with the assay reagent PAA dye to form fluorescent products with excitation at 390 nm and emission at 470 nm. The kit can be generally used for measurements of micromolar concentrations of primary amines or ammonia or their salts in biological samples, biochemical reactions, pharmaceutical products and environmental water samples. The assay is not compatible with amine-based buffers such as Tris buffer. It is compatible with thiol compounds such as DTT. 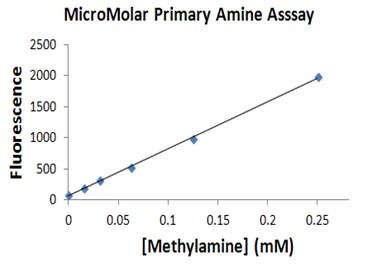 The MicroMolar Primary Amine Assay Kit (Catalog number PAA100K) includes 0.5 ml of 10 x PPA dye, 5.5 ml of Assay buffer, 5 ml of reagent A and 0.05 ml of 1 mM methylamine-HCl. It is for measurement of 100 samples using 96-well plates. Cuvettes may also be used for measurements.